Make your own song with the UJAM studio! The UJAM Studio is your personal, easy to use, cloud-based studio that lets you make your own music – even if you don't have musical or technical knowledge. Create your own song, send musical greetings or remix songs! Professional music editor for everyone! Entire process of music creation changed when computer arrived, enabling music producers to transfer sound recording, editing, arranging, and preparing for final publishing state directly from their computer. These kinds of professional services became more and more powerful, eventually enabling musicians to take their entire recording studio inside their laptop or PC. Now, general population can enjoy such tools, although, majority of people just want an easy and streamlined way to create music on the go. One of the best ways you can do just that is UJAM, easy to use music creation suite for people of all knowledge levels, especially for users who are not skilled musicians by they want to quickly produce a song that will be ear-catching and professional-sounding. UJAM works on the principle of simple tutorials that will guide you through several distinct part of song production, which start at you either singing, humming or playing the main theme of your song, which will enable UJAM to automatically build around it song that you can tweak to perfection in any musical style you choose. If you need to create a short tune for your project, YouTube page, videos or trailers, you can’t go wrong by choosing UJAM Review. UJAM was founded in 2010 by the trio of Pharrell Williams, Peter Gorges and celebrated German composer and music producer Hans Zimmer. Their goal from the very start was to enable general population that consist both from complete music novices, enthusiasts and seasoned professionals to create music online with tools that will build entire musical score around your primary tune that you can sing, hum, play or upload directly on your PC. The process of music creation on UJAM starts with making your own account, where you will be able to store your songs, and easily share them with your friends, family, co-workers, and the entire internet. 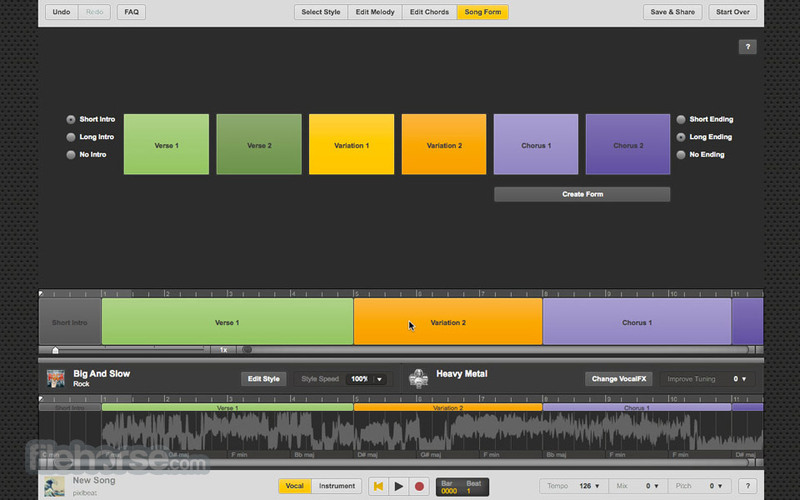 Song sessions start by singing, humming, uploading your song from local storage or choosing one of the numerous templates. This recording can then be edited however you want and with the few simple presses of a buttons, UJAM will build a framework of your song. You can chose in which style this song will be made, and you can customize every step of its creation and individual sounds. You can change on the fly song structure, main melody, chord progressions, backing instruments and more, all enabling you to quickly get to the song template that can be listened by you and your friends. This fast and iterative process of song-making is perfect for musicians who have a lot of inspiration and who want to quickly get a sense if their song will be hit or not. As UJAM uses real instruments recorded by professional producers, so the result will always sound great. Want your song to sound like Rock, Hip-Hop or Jazz? Every style is just one click away. 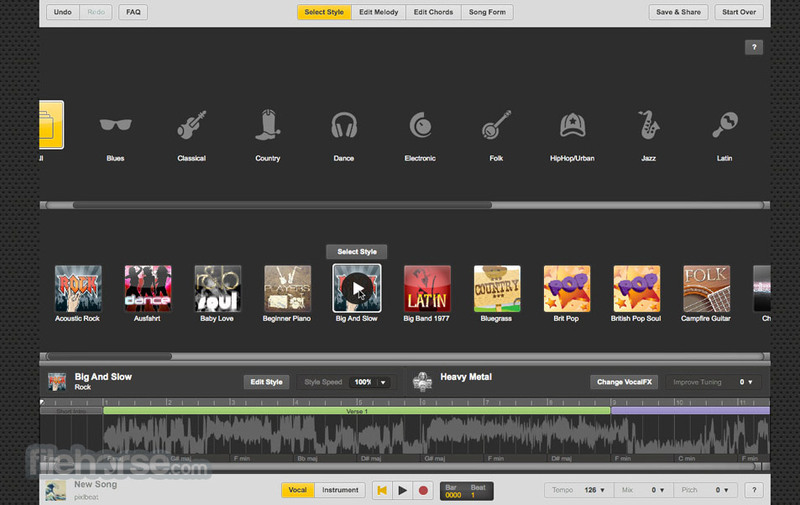 You can even combine instruments from different genres and create your own custom style. If you are a musician, the UJAM Studio is the perfect tool to try out your ideas. 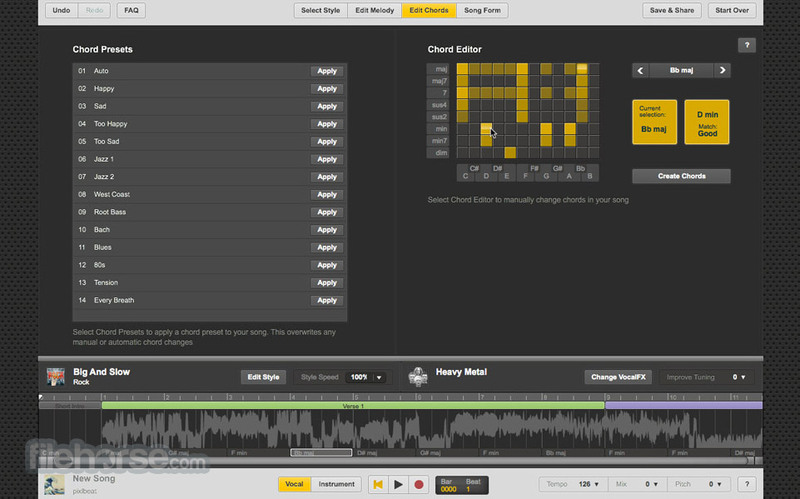 You are able to edit chord progressions, song structure, the main melody, backing instruments and a lot more. Within a few minutes you'll know if your latest song idea will work or is a hit. Interface of UJAM Studio uses great mix of black and orange, with professional and modern design that is responsive, fast and intuitive. After just few minutes you will be able to get a sense of the entire song production procedure, leaving you with a lot of space for exploration, testing of advanced tools and crafting of your perfect song. All the navigational options, buttons, dials and other control mechanisms are designed with the aura of professional software package that is aimed for users of all knowledge levels. UJAM is currently a free service that can be used inside your PC browser (both windows and Mac), with additional VJAM app for iPhone devices that have interesting video editing functionality. New account can be created either with valid email account, or by using Facebook or Google credentials. 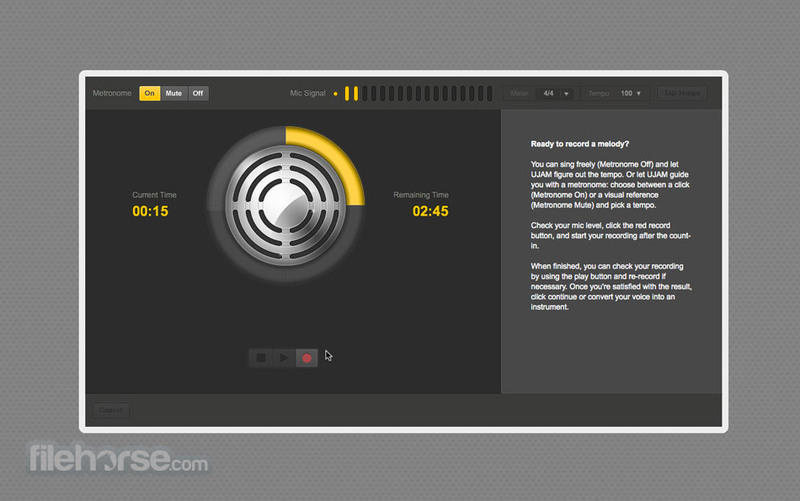 UJAM is great tool for creating music, enabling you to easily control all aspect of music production. After a short period of introduction to all that it has to offer, you will quickly be able to create songs that will make you proud. Try it out, it’s free! With UJAM anyone can make music. For free! Want to know how to make your own music? 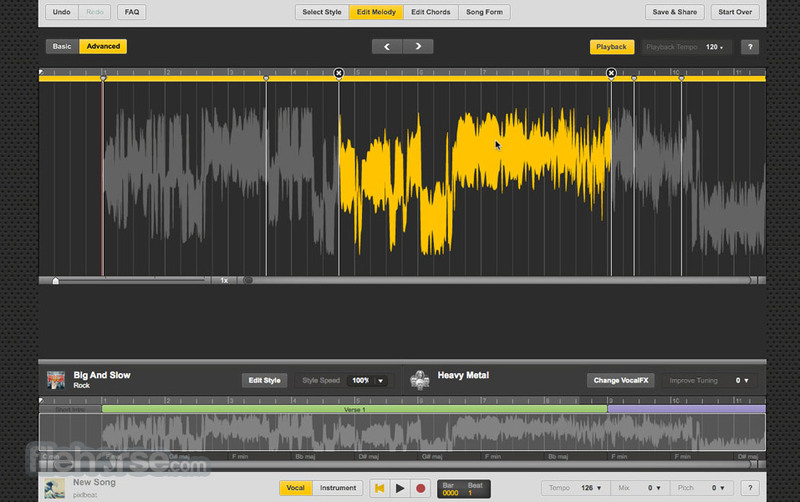 UJAM offers online software that allows you to record and produce your own song. All you need to create great-sounding music is an idea. Turn that melody in your head into a song. As UJAM is cloud-based, no download is required.